Queensland is Australia's second largest state — fondly known as the sunshine state for its warm climate, golden beaches, relaxed lifestyle and friendly locals. Its capital city, Brisbane, has a population of around 2 million people and is located in the sub-tropical south-eastern corner of the state. 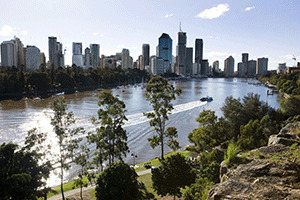 Brisbane is about 30 kilometres from the coast, on the banks of the Brisbane River. It has experienced significant growth and development in the past ten years and continues to blossom as Australia’s fastest growing capital city. Brisbane has a wide range of shopping, dining and entertainment options available, especially around the riverside South Bank precinct, and these continue to expand as the city's population grows. One of South Bank's main attractions is Streets Beach, which is Australia's only inner-city beach and a great place to swim and relax amid the busy Brisbane CBD. There is a wide range of markets to explore each weekend, all of which are outdoors due to the warm Queensland climate. There is also a thriving arts scene, with festivals and events happening year-round, such as the annual Brisbane Festival and the Ekka. For fun in the sun, there are a number of islands close by where you can relax and enjoy beach and water activities. These include Moreton Island, North Stradbroke Island, South Stradbroke Island, Bribie Island and St Helena Island. Just an hour south-east of Brisbane is one of the most famous stretches of beach in the world — the Gold Coast. 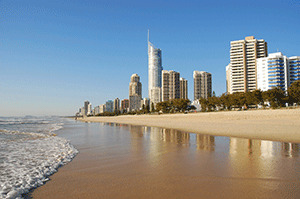 This area, which includes Surfers Paradise, is renowned for its miles of golden sand, surf beaches and warm water. It is one of the world’s major tourist destinations and attracts countless visitors — both domestic and international — for the scenery, theme parks and the party atmosphere. North of Brisbane you will find the Sunshine Coast, which is known for its gorgeous beaches, laid-back lifestyle and family atmosphere. Further north, you will find Townsville and Cairns, which are located in the tropical northern region of Queensland. Both are busy tourist centres and excellent destinations from which to explore tropical rainforests and the Great Barrier Reef. This World Heritage listed natural wonder stretches over 2500km and is the largest coral reef in the world. The Whitsunday Islands are another popular attraction in Queensland's north — its 74 islands boast stunning beaches, glamorous resorts and plenty of water activities. For further information, see the Queensland Holidays website. The median weekly rental price for a house in Brisbane is AUD$400, while the median weekly rental price for a unit is $375. The median weekly rental price for a three-bedroom house in regional areas ranges from $360 in Far North Queensland to $420 on the Gold Coast. Brisbane and its surrounds are well connected by trains and buses. Most regional areas are serviced by local buses, but access to a form of personal transport may be required. All full-time students receive a public transport concession card. For more information about public transport and fares, see the TRANSLink website. Queensland enjoys a warm, stable climate throughout the year, with an average maximum temperature of 25°C, although Tropical North Queensland experiences a dry season from May to October and a wet season from November to April, which is characterised by higher humidity. Note: Information and figures presented here are intended as a guide only and may change. Source of rental data: Domain Rental Report, September 2018 and Australian Property Monitors, December 2013. There are six universities in Brisbane and seven in regional Queensland, in addition to a range of private higher education providers and TAFE institutes. 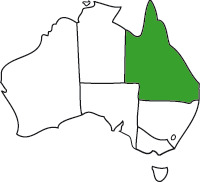 As one of the larger states in Australia, Queensland's student population is around 223,000. Around 10 per cent of the state's domestic students are from interstate, while a further 24 per cent are from overseas.